Abstract: AMD's 3.4GHz Phenom II X4 965 Black Edition processor represents a slight clock speed increase over the previous forerunner, the quad-core 955 Black Edition, and competes with Intel's existing quad-core family of socket 775 CPUs. AMD's Phenom II X4 965 Black Edition processor represents a speed boost over the previous forerunner, the 955 Black Edition. The 3.4GHz quad-core Black Edition socket AM3 chip is intended to compete against Intel's existing LGA775 quad-core processors, but the real question on everyone's mind is how it will fare against Intel's Core i5 CPUs? That's the crux of the situation facing consumers; AMD's Phenom II socket AM3 processors are a safe bet, the Core i5 is newer technology though. Intel's socket 775 is nearing the end of its lifespan and upgrading to socket 1156 Core i5/i3 CPUs is... well, complicated. AMD oon the other hand has a mature platform, the chipsets are transitioning at a measured pace from DDR2 to DDR3, and its CPUs have fantastic backwards compatibility. Looking forward, future upgrades are easy to plan for. The AMD Dragon platform may be pure marketing, but the potential of its integrated chipset families (think: AMD 790G, 785G and 690G) is fantastic where low cost and HD friendly content acceleration is concerned. When it comes to value for performance, AMD has it down to an art. Since the quad-core 3.4GHz Phenom II X4 965 Black Edition processor is a refresh, most of the specifications remain the same between it and the Phenom II X4 955 BE, the previous flagship quad-core processor from AMD. Both CPUs have 6MB of shared L3 cache, 512KB of L2 cache for each of the four cores and are built on the 45nm Silicon-on-Insulator technology. The Phenom II X4 965 BE is based off the AMD 'Deneb' architecture, has a 128-bit wide memory controller and is compatible with DDR2-1066 and DDR3-1333 memory. Like all Black Edition processors, the Phenom II X4 965 BE features an unlocked multiplier that makes overclocking a very exciting proposition. 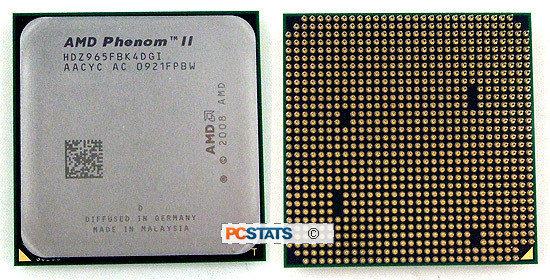 If you recall, PCSTATS brought the Phenom II 955BE from 3.2GHz all the way up to 4.0GHz! Based on those results, we have high expectations for the Phenom II X4 965 Black Edition today! While AMD has increased the clockspeed of this processor by 200MHz, the overall heat levels of the Phenom II X4 965 Black Edition have thankfully stayed quite low. The 965BE has a TDP of ~140 Watts, so you won't need a dramatically new CPU cooler in order to get decent overclocks out of it. 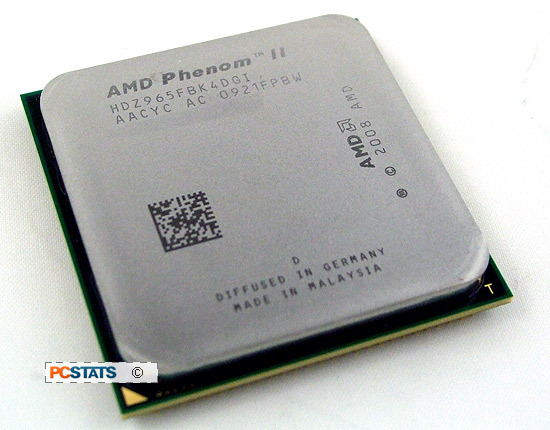 Manufactured by Global Foundries FAB 1 in Dresden Germany, the Phenom II X4 965 Black Edition contains 758 million transistors on a die 258mm2 in size. The CPU is compatible with the Hypertransport 3.0 specification, operating with a 16-bit link at 2.0GHz up and down stream. Total system bandwidth rises to 37.3GB/s on DDR3 platforms, 33.1GB/s for DDR2 systems. AMD's had designed the Phenom II processor family to make it as easy to transition from older socket AM2 and AM2+ computers to its socket AM3 CPUs and DDR3-based motherboards. The Phenom II X4 965 Black Edition is built for socket AM3 motherboards, but can be dropped into socket AM2+ motherboards as an easy upgrade, switching between its embedded DDR2 and DDR3 memory controllers. With a suggested retail price of $245 USD, the 3.4GHz Phenom II X4 965 Black Edition is priced nearly $60 less expensive than Intel's big seller, the Core i7 920. AMD is sweetening the deal even further in North America by offering bundle deals that will see ~$40 knocked off the total price when paired with certain motherboards, or $25 off the price of Corsair memory / ATI Radeon videocards added on for greater savings. The stores participating include NCIX.com, Tigerdirect.com, Zipzoomfly.com, Mwave and of course Newegg.com/Newegg.ca. As incentives go, AMD is making a pretty compelling bargain. Just a few months ago AMD brought out its Dragon platform, a combination of its new Phenom II processors, socket AM3 motherboards, and Radeon 48XX series of videocards. AMD is back with a few more upgrades to their arsenal. The newish Dragon platform consists of the AMD Radeon 4890 videocard, AMD's socket AM3 motherboards, and a new addition to the Phenom II line of processors: the AMD Phenom II 965 Black Edition. AMD Overdrive software is designed to make overclocking AMD CPUs and GPUs easier and more accessible. While both NVIDIA and Intel offer tools which enable overclocking from within Windows, the range or depth of options provided by AMD Overdrive is not matched. The new AMD Overdrive 3.0 software introduces two key new elements: Smart Profiles and Black Edition Memory Profiles . Smart Profiles can performance tune individual CPU cores automatically when the AMD Overdrive software detects an application launch. For applications that are optimized for dual core processor, the new Overdrive software can dynamically disable two cores of a quad-core Phenom II processor, and overclock the remaining two to faster speeds. Let's look at these parts of the Dragon platform in a little more detail, then we'll dive into Phenom II X4 965BE overclocking, core-by-core system power draw tests and a detail roundup of benchmarks! Pg 4. Black Edition Overclocking - Breaking 4.4GHz? Pg 14. Core i5 or Phenom II X4 965 Black Edition?